Comics readings, educational filmstrips, tuba music, lo-tech animation, live drawing, and much more by Brian Dewan, Danny Hellman, Dyna Moe, Katie Skelly, Jim Torok, and Doug Skinner with Shae D’lyn & Ralph Hamperian. Hosted by R. Sikoryak. 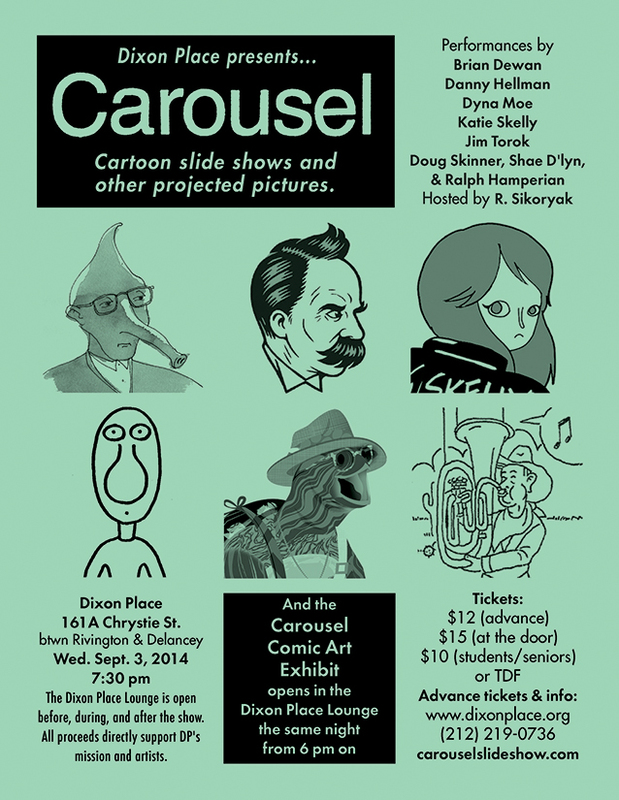 And the Carousel Comic Art Exhibit opens in the Dixon Place Lounge the same night, from 6 pm on. With art by Brian Dewan, Emily Flake, Danny Hellman, Miriam Katin, Jason Little, Dyna Moe, R. Sikoryak, Doug Skinner, Jim Torok, and Kriota Willberg.